If you look out your front window one morning and see herds of zombies staggering around, you have two options. 1: make a break for it and eventually get horrifically eaten, or 2: join them. It may not be the most heroic choice, but this super-creepy Zombie Costume makes it pretty easy, and it definitely beats being eaten! We know you're thinking, "No! You need to grab a shotgun, tie a dirty bandanna around your head, and fight for humanity!" To which we respond, "Come on, man, they're zombies." Every zombie movie shows flocks of survivors fleeing frantically at the sight of an undead horde, while a few brave souls band together to make a final stand, and promptly get eaten for their trouble. But people rarely try just teaming up with the shambling ghouls and seeing where it goes! Maybe after all the humans are eaten or turned into dead-heads themselves, the zombies just go back to what they were doing before they were zombified. And if that's the case, you would be totally free to return home and go back to bed! They never show that part in the movies, though, do they? Well, okay, maybe being a zombie would be better without all the decomposition and people-eating. 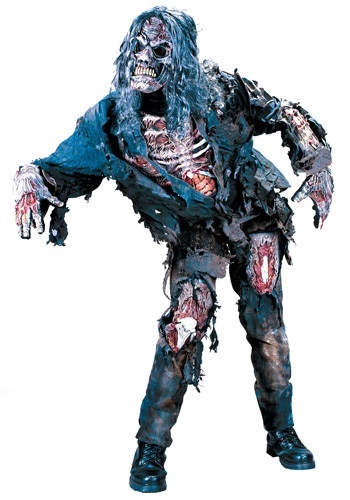 But this freaky full body costume lets you look like a reanimated corpse without all the gross stuff. The shirt and pants look like tattered clothes with exposed bones and organs attached, which go perfectly with the gruesome gloves and zombie mask. You may not like the undead apocalypse as a human, but in this costume, you can at least enjoy it as a zombie!